150 total news articles in this section, 10 per page. 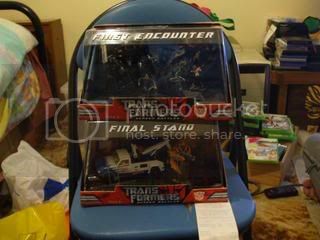 nathans of the Ozformers board has spotted the Transformers Movie Screen Battle Packs featuring Longarm Final Stand and Barricade First Encounter Sets at his local Toys 'R' Us. The sets are expensive at $49.99 a piece, and have yet to be spotted elsewhere in Australia so may not be available at your local Toys 'R' Us. Reports are coming in that the new wave of Transformers Movie Cyber Slammers figures have been sighted at retail in the United States. Expect to see these child-friendly Transformers in your local stores soon, just in time for the holiday season! Deep Water found them at Toys R Us in Michigan! If you've been interested in these toys, take a look at your local TRU, because I have also seen sitings elsewhere for these same items (like New York!). The proof is in the pic, and this is what Deep Water found! Go out and look for them, and when you find them call out the name 'Deep Water' to give thanks! Okay I'm not serious about that part, but thanks Deep Water! A Transformers Megatron Animated toy (prototype) with cartoon accurate colors has appeared on eBay. The auction shows Megatron in both robot mode and alt mode. Click here to see more pictures. New Movie Toys found in Portugal! Rescue Ratchet, Thundercraker and Leader Brawl have been seen in TRU in the Colombo Shopping Mall, while Cyber Slammin' 2008 Bumblebee ,and Deluxe Arcees, Concept Camaro Bumblebee and Dreadwings have been sighted in Carefour, Continente. Good news for our European Comrades who often get the raw end of the deal when it comes to Transformers figures! A seller on the Chinese auction, Taobao.com, has posted first images of Twitcher F451, which is a green repaint of the Real Gear, Highscore 100. Twitcher 451 is a Decepticon. No word yet on its release date. The Target-exclusive "Evolution of a Hero" Bumblebee 2-Pack has been sighted at a Zellers store in Montreal, Canada. TakaraTomy has updated the Transformers website once again. Three new Transformers Movie characters have been released in Japan. Click here to view all of them. TakaraTomy also has several Transformers Movie DVD campaigns. Exclusive Transformers are available through select sites with additional purchase of the Transformers Movie. This model is available at Toshiba. Click here to see more. This model is available at Lawson. Click here to see more. EZ Collection Bumblebee Metallic ver. The Allspark Wave 1 figures Camshaft, Cliffjumper and Landmine(along with the previously very rare and hardly seen Rescue Ratchet and Thundercracker) have been spotted in a Big W store in Western Sydney. Where a line has been spotted once, more sightings will most certainly follow. This is great news as the Allspark lines had previously only been spotted at specialist toy stores such as Toyland and Toyworld to this point. So keep on the lookout for these figures in your local Big W's. To read the original Sighting, and to post your Australia Sightings, please click here.